As much as I hate to admit it, I’m a big fan of Diners, Drive-ins, and Dives. Guy Fieri might be the biggest douche bag on TV, in close competition with the Jersey Shore cast. He just bothers me, with his frosted tips and abundance of “bling”. Plus what kind of chef doesn’t eat eggs? Either way, I like the show because it goes around the country finding the lesser known but equally awesome little restaurants that don’t get the notoriety as a celebrity chefs restaurant. 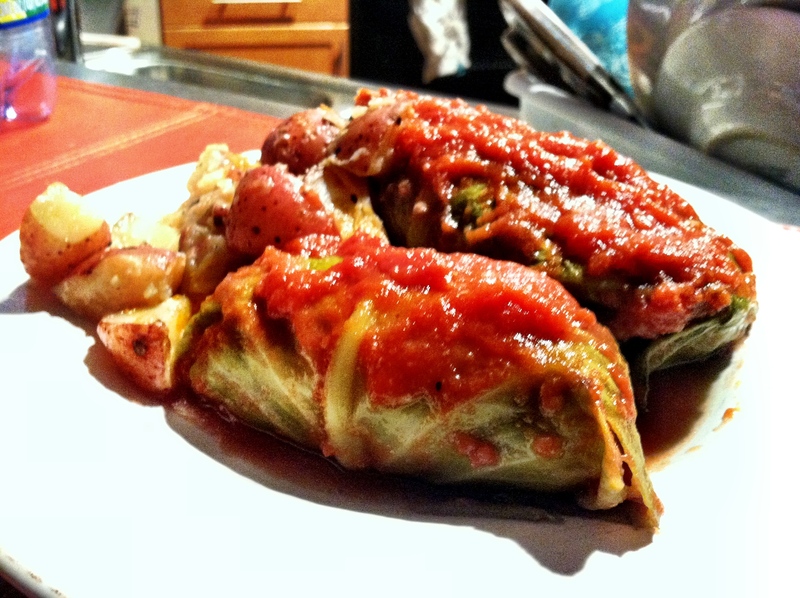 On more then one occasion I’ve seen a diner cooking up cabbage wraps in classic European fashion, and I kept telling myself I need to try making them. Well this past weekend I got around to it, and let me say, they were delicious. A flavorful combination of meat, cabbage, and sauce that works together perfectly and is super easy to make, especially with a slow cooker. The meat is spiced and mixed with rice, the cabbage soft but crunchy (somehow? 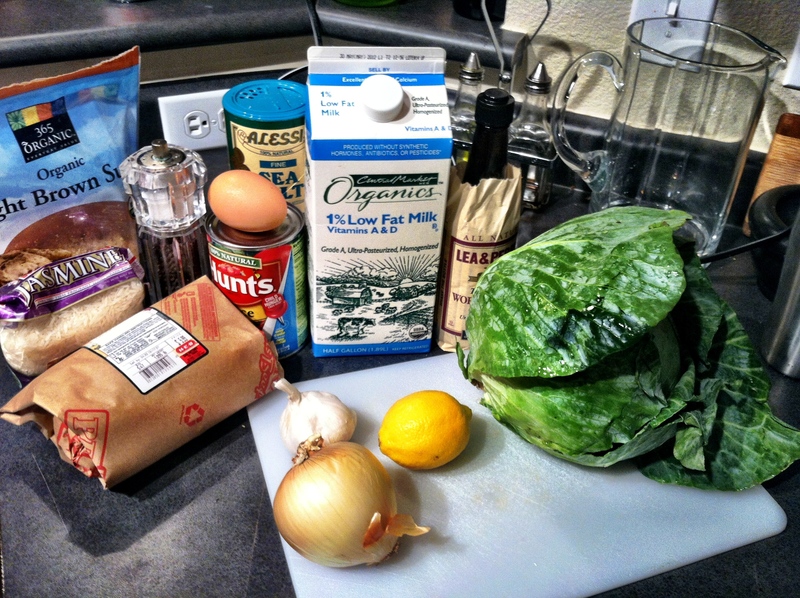 ), and a sauce that is worthy of making by itself. 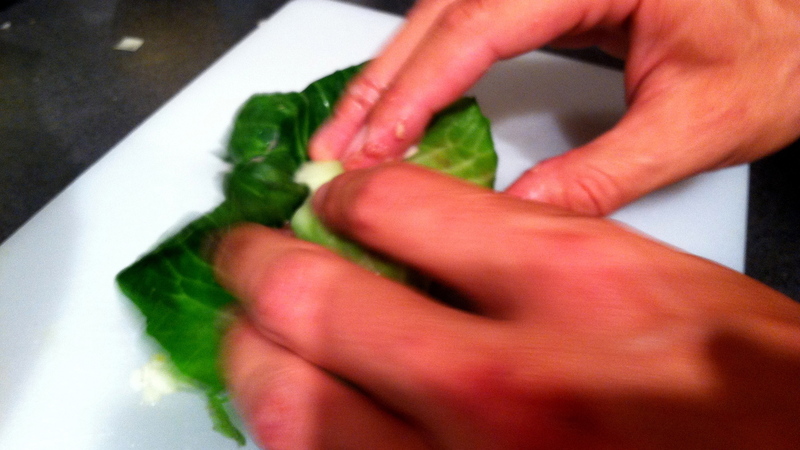 I removed the cabbage leaves from the raw head of cabbage but later read a good tip to core it out and steam the leaves. After a point the raw cabbage gets impossible to peel off so I would suggest doing the steam method, but removing raw worked too. In any event, you need to bring a large pot of salted water to a boil to soften the leaves. Drop them in for 2 minutes then remove, strain, and set aside. At the same time, cook your rice making at least 1 cup cooked rice. 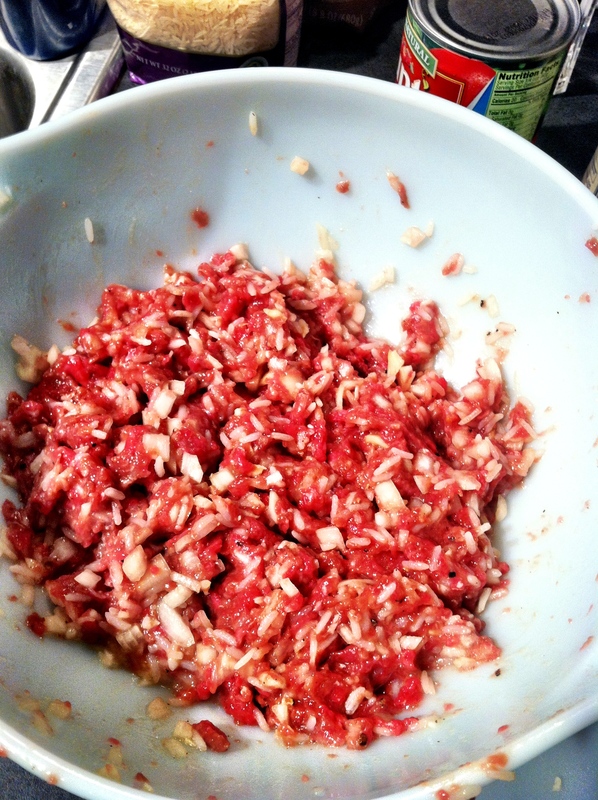 In a large bowl, mix the cooked rice, egg, milk, onion, garlic, ground beef and salt and pepper. 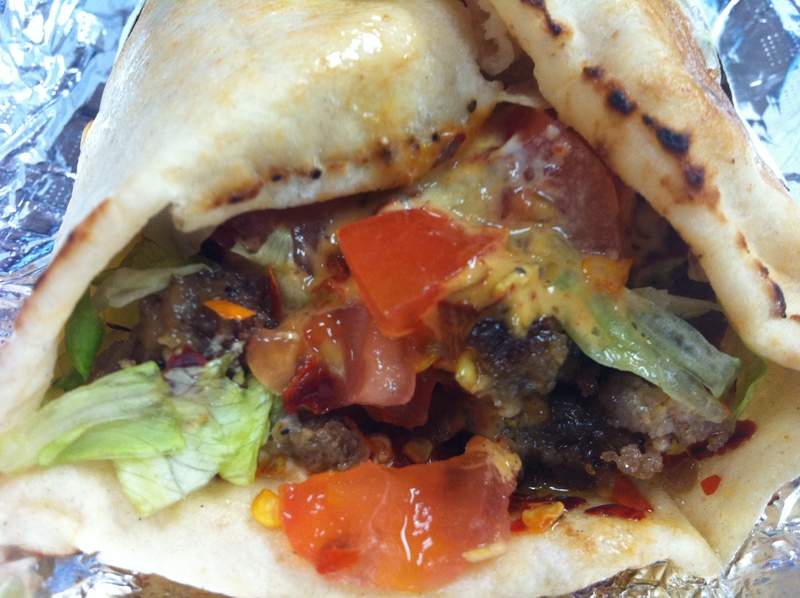 The reason the beef needs to be so lean is that its wrapped raw, so a fatty mix will make for a very greasy roll. 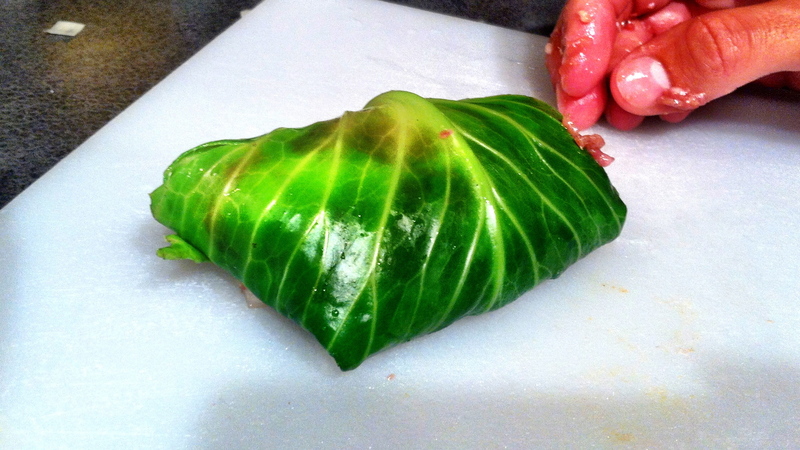 Next, set out the cabbage leaves and scoop about 1/3 of a cup of meat mixture into the lower center of the leaf. 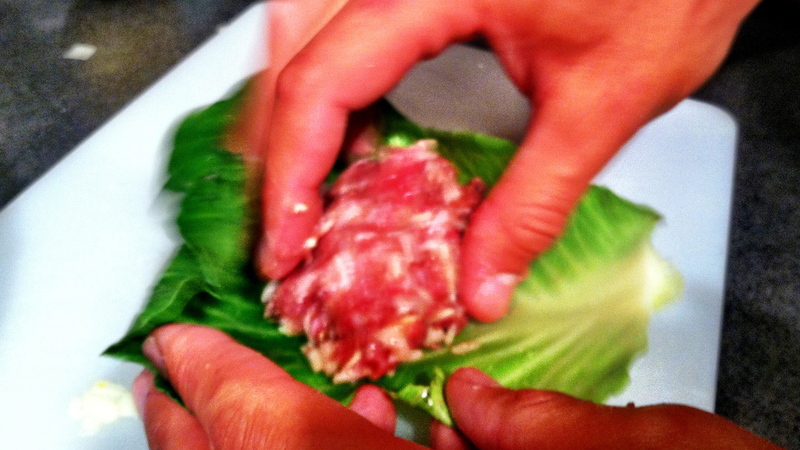 Roll the bottom of the leaf over the meat, tuck in the sides, then finish rolling over to seal the meat inside. It looks like a mini green burrito. 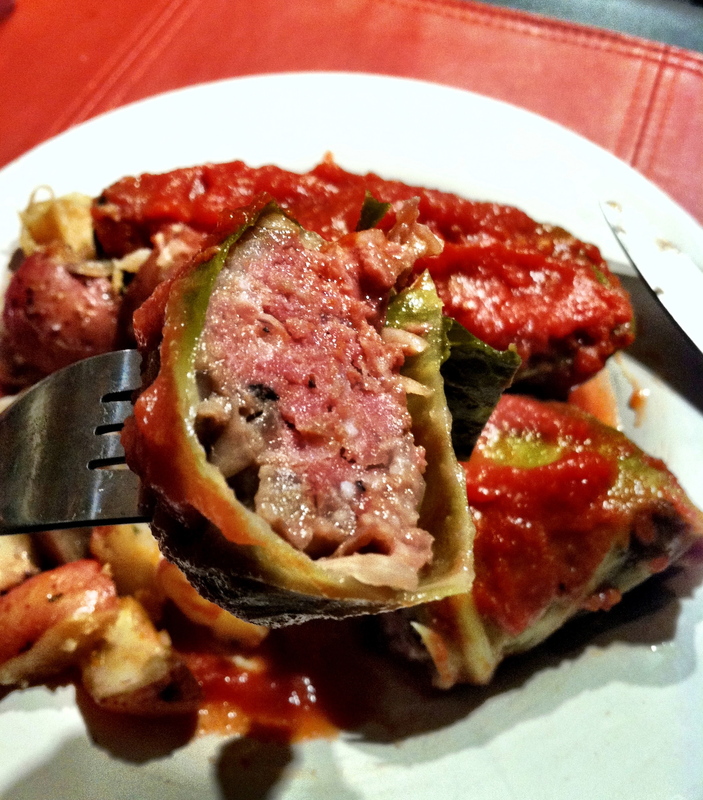 Once you roll all the meat and leaves together, load them into the bottom of your slow cooker and start the sauce. 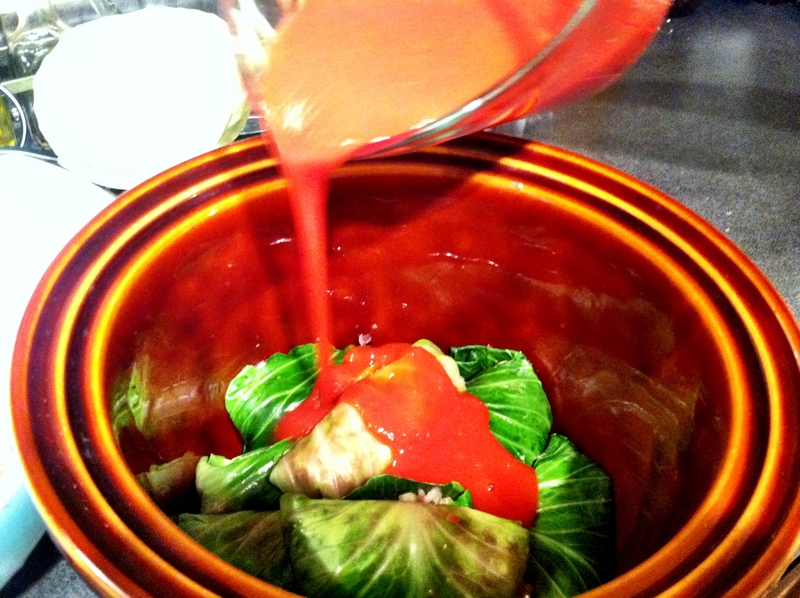 Mix the tomato sauce, brown sugar, lemon juice, and worcestershire together and whisk quickly. Pour it over top of the rolls so they are completely covered. Set the slow cooker to 250° and let them cook for 8 hours and enjoy! My job this week and last has had me onsite at the Jefferson Square shopping center off 38th 1/2 street. The posh little center is apparently quite popular as it houses some nick-nack stores, an eye doctor, a hair salon, and Anderson Coffee (good coffee for only $1) among others. But there is also this lunch joint nestled in the corner called Lee’s Meat Market that last week I thought was a butcher shop but have since learned otherwise. On Monday we were working (I do construction and renovations) outside the shop which happened to be closed for the floating holiday after Easter, but the 50 people who showed up throughout the day did not know that. Literally, from 10am until 5pm people would pull into the parking lot, get to the door, and moan in misery when it was locked. That’s when I knew I had to try it. We started letting people know it was closed to spare them the extra ten steps from their car to the door. Eventually questions like ‘What’s good?’ came about. 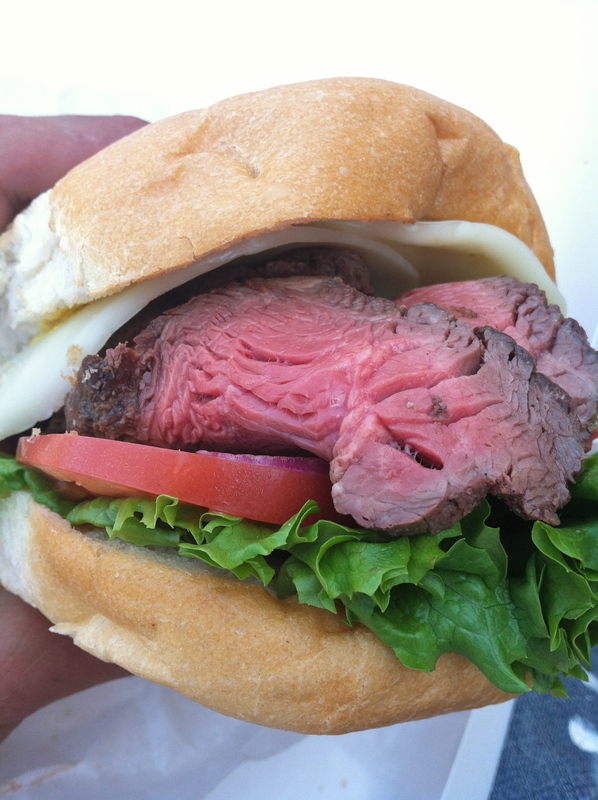 Most often the response was the beef tenderloin sandwich. 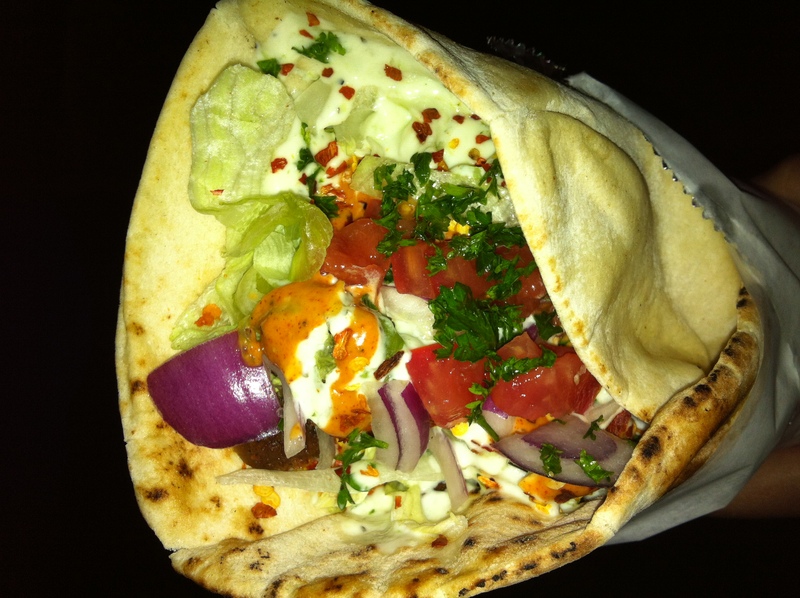 So on Tuesday I by-passed packing a lunch and knew what to order. It’s a small spot with only about 3 stools at a window bar for eating in, while the rest of the place was packed with people waiting for to-go orders. The line went quick and Lee, the owner who I have found out is very nice and hospitable (discounted iced tea because it was 90 out), took my order. Choose between wheat or sourdough. I went sourdough. Lettuce, tomato, mayo, spicy mustard, and provolone. 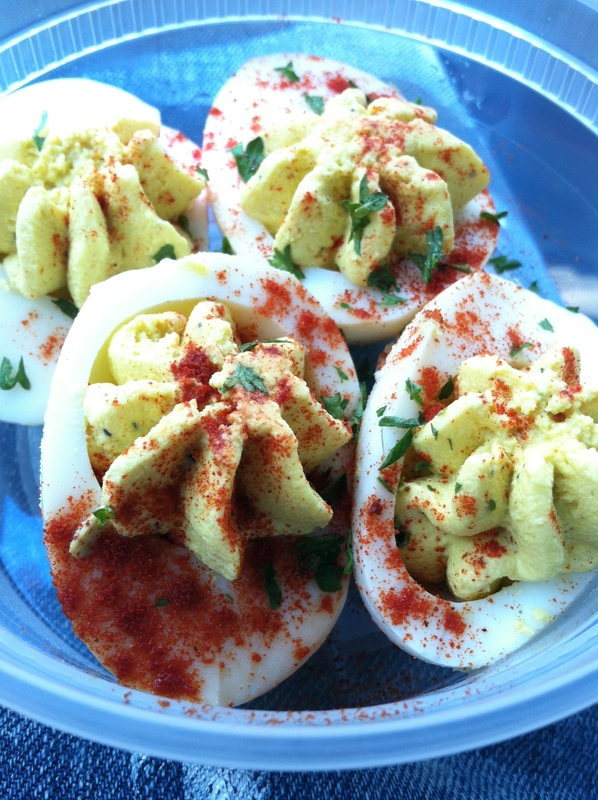 I also ordered the small side of deviled eggs because I LOVE deviled eggs. Creamy and delicious and heavy on the mustard just like I like them. They were gone before the sandwich came out the window. Today I was excited to try it again, but being adventuresome I decided to expand my knowledge of the menu and be bold. I went with the fresh chicken salad sandwich, again on sourdough, with lettuce, tomato, onion, and provolone. It also, was magnificent. Chunks of chicken mixed with celery, red grapes, and chopped pecans mixing together for a salty-sweet-soft-and crunchy experience. To accompany the sandwich, I ordered a pint of tomato basil soup because my eyes are always bigger then my stomach. Although that may be the case, I’m glad I did. It was AWESOME. The soup was thick and creamy and not too salty and had roughly chopped tomatoes floating in the red sea of bliss. To top it off, it came with a side of cheddar toast. Yea, no hint on the menu that it comes with your soup for only $4.50 but boy did my eyes light up when I saw it. 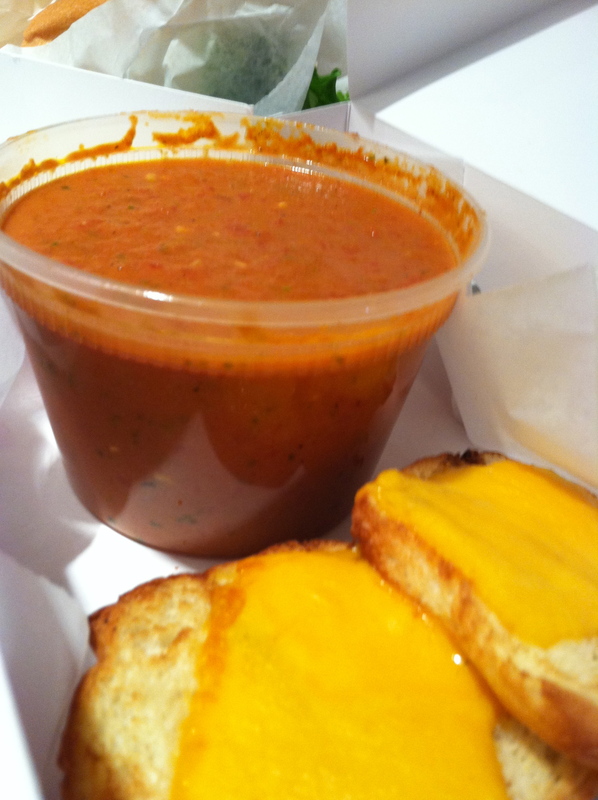 Toasty and cheesy and perfect for dunking in the soup. 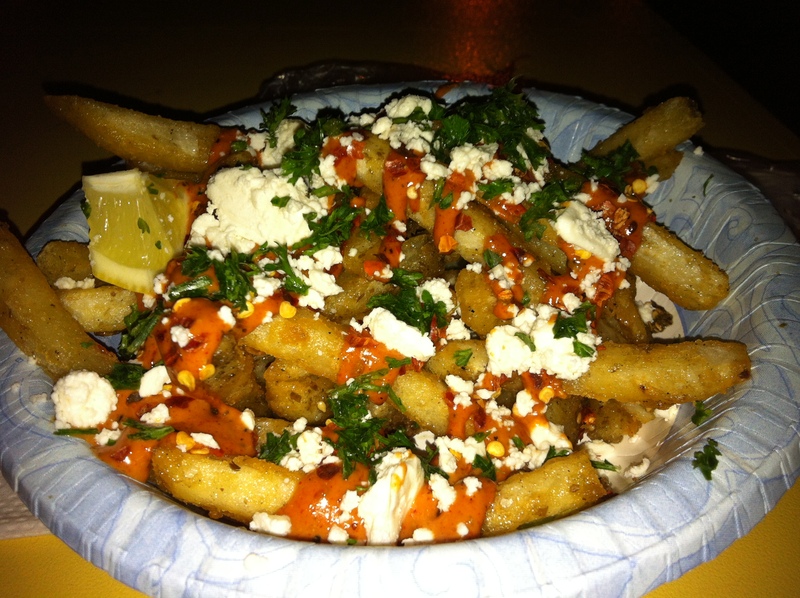 I’m seriously enjoying reliving this meal right now…. 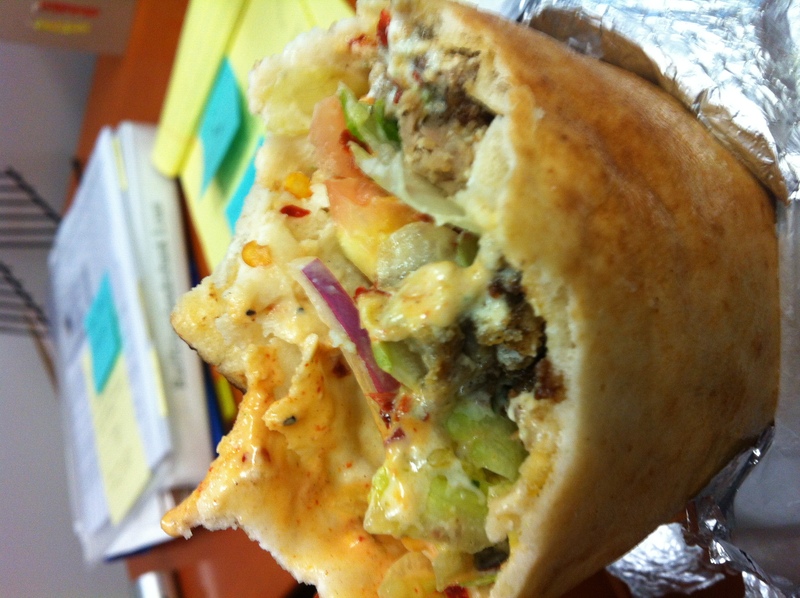 In closing, I HIGHLY recommend you try Lee’s Meat Market if you’ve never been. Sandwiches are about $7, and I get the big tea which is a quart of fresh iced tea for $1.50. The menu is huge and as well as food to-go, they do catering and bulk orders of beef, lamb, chicken, etc. So yea, I guess it was a butcher shop after all.